The tragic death of Icarus is quite a popular story for narrative paintings from classical times onwards. It has also lent itself to contrasting treatments, which make it valuable for gaining insight into the techniques of narrative painting. According to classical Greek legend, Daedalus was a master craftsman who was most famously responsible for creating the Labyrinth on Crete, which contained the Minotaur. Because of his knowledge of the Labyrinth, Minos, the king of Crete, shut him up in a tower to prevent him from spreading that knowledge. Daedalus therefore set about building himself and his young son Icarus sets of wings, so that they could fly from the island and escape. Ovid’s Metamorphoses (book 8, 183-235) describe how they did this, tying feathers together, securing them at their midpoints with string, then at their bases using beeswax. Once Daedalus had completed his own set of wings, he found that flapping them in the manner of a bird generated lift, so he made a second pair for his son. Father and son then prepared to make their escape from Crete. Daedalus specifically warned Icarus that he should not fly too low, or the moisture from the sea would soak the feathers, nor too high, or the heat of the sun would melt the wax and the wings would disintegrate. They set off, and were making good progress passing several islands when Icarus became over-confident and soared upwards towards the sun. This melted the wax as Daedalus had warned, Icarus’ wings fell apart, he plummeted into the sea, and was drowned near what became known as Icaria, an island ten miles southwest of Samos, in the northern Aegean Sea. There was also a separate myth concerning Phaethon, which has sometimes become confused with that of Daedalus and Icarus; because the two legends have a common theme of people becoming overambitious and coming to grief as a consequence, this confusion may of course be intentional. Nicolas Poussin (1594–1665), A Dance to the Music of Time (detail) (c 1634-6), oil on canvas, 82.5 × 104 cm, The Wallace Collection, London. Wikimedia Commons. In Greek mythology, Phaethon was the son of Apollo, the sun god, and the oceanid Clymene. Apollo, as the god of the sun, drove the chariot of the sun across the heavens each day, as shown in the detail above from Poussin’s A Dance to the Music of Time (c 1634-6). When Phaethon was challenged by his peers to prove this, he asked his father, who promised to grant him whatever he wanted in proof. Phaethon asked to drive the sun chariot for a day, and despite Apollo’s concerns, did so. Once Phaethon was in charge of the chariot, he lost control of the horses, and Zeus had to kill him with a thunderbolt to prevent the chariot from crashing to earth and burning it up. 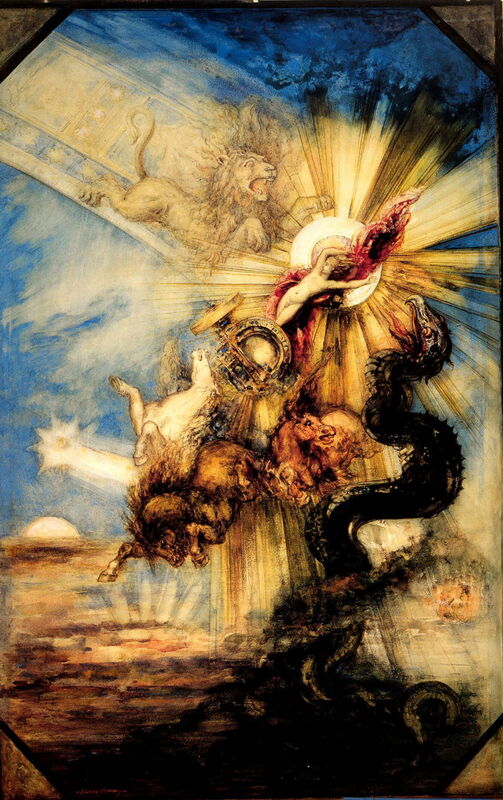 This is shown in Moreau’s The Fall of Phaeton (1878) below. the importance of thorough planning and preparation. There are two significant changes of fortune, both of which are accompanied by some element of revelation: the first is when Daedalus and Icarus start their flight, which marks a change from bad to good fortune, with the new knowledge being the discovery that they can fly. The second is the moment that Icarus’ wings disintegrate, and his fortune changes from good to bad, with the confirmation of Daedalus’ prior suspicion that the beeswax would melt. As moments of peripeteia, according to classical Aristotelian narrative, and particularly for a tragedy such as this, these should be the most powerful and moving events to show in a painting, given references to the prior and subsequent states of fortune. In the overall structure of the story, there is no doubt that the second moment of peripeteia is the climax, with the most dramatic action. Andrea Sacchi (1599–1661), Daedalus and Icarus (c 1645), oil, 147 x 117 cm, Musei di Strada Nuova, Genova, Italy. Wikimedia Commons. Andrea Sacchi’s (1599–1661) Daedalus and Icarus (c 1645) shows Daedalus, at the left, fitting Icarus’ wings, prior to the boy’s flight. Icarus has his right arm raised to allow the fitting, and looks intently at his new wings. Daedalus is concentrating on adjusting the thin ribbons which pass over his son’s shoulders, and may be explaining to him the importance of flying at the right altitude. Anthony van Dyck (1599–1641), Daedalus and Icarus (1615-25), oil on canvas, 115.3 x 86.4 cm, Art Gallery of Ontario, Toronto, Canada. Wikimedia Commons. Van Dyck’s (1599–1641) slightly earlier Daedalus and Icarus (1615-25) puts the boy at the centre, his wings already attached to his back, and his father apparently explaining the importance of flying at the right altitude. Father and son hold out their right hands, pointing with the index finger as if using it to enumerate important matters. Icarus looks to the front, appearing to concentrate, while his father looks at him and appears to be speaking. Frederic, Lord Leighton (1830–1896), Icarus and Daedalus (c 1869), oil on canvas, 138.2 × 106.5 cm, Private collection. Wikimedia Commons. Frederic, Lord Leighton (1830–1896), in his Icarus and Daedalus (c 1869), shows the pair on the roof of the tower overlooking a bay. Daedalus is crouching while fitting his son’s wings, and looks up at Icarus. The boy holds his right arm up, partly to allow his father to fit the wings, and possibly in a gesture of strength and defiance, as the two will shortly be escaping from Crete. Icarus is looking to the right, presumably towards the mainland to which they will shortly be travelling. 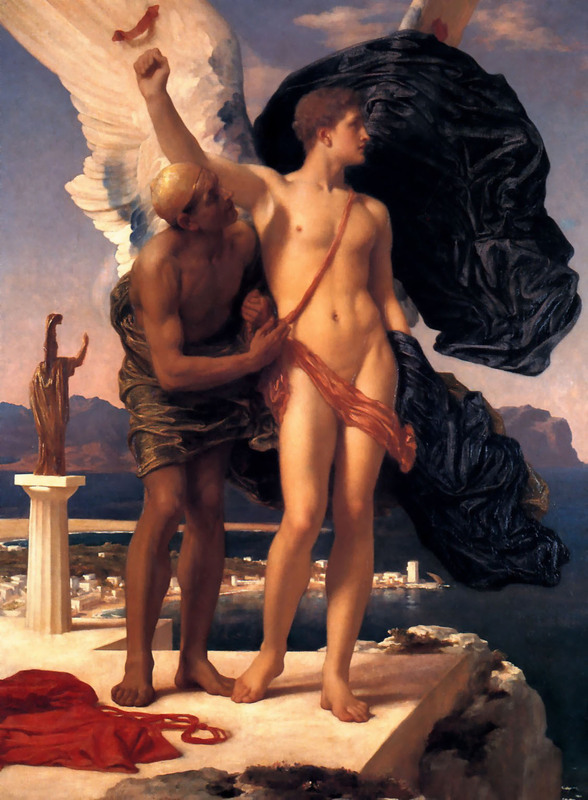 This painting also suggests that Daedalus is dark-skinned, and Icarus more ‘Caucasian’ in appearance; Daedalus is wearing a scalp-hugging cap which appears intended for flight. Charles Paul Landon (1760–1826), Icarus and Daedalus (1799), oil on canvas, 54 × 43.5 cm, Musée des Beaux-Arts et de la Dentelle d’Alençon, Alençon, France. Wikimedia Commons. Landon’s (1760–1826) Icarus and Daedalus (1799) shows the moment that Icarus launches in flight from the top of the tower, his arms held out and treading air with his legs during this first flight. Daedalus stands behind, his arms still held horizontally forward from launching Icarus. Few paintings seem to show father and son flying successfully across the sky, but they resume immediately after Icarus’ wings have disintegrated, and he has started falling through the air. 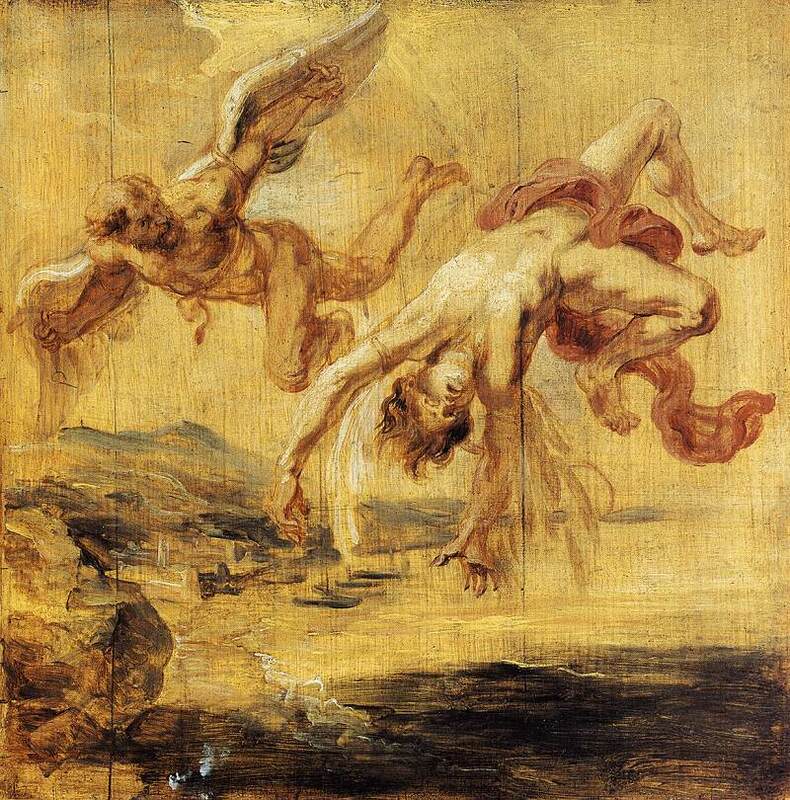 Peter Paul Rubens (1577–1640), The Fall of Icarus (1636), oil on panel, 27 x 27 cm, Royal Museums of Fine Arts of Belgium, Brussels. Wikimedia Commons. 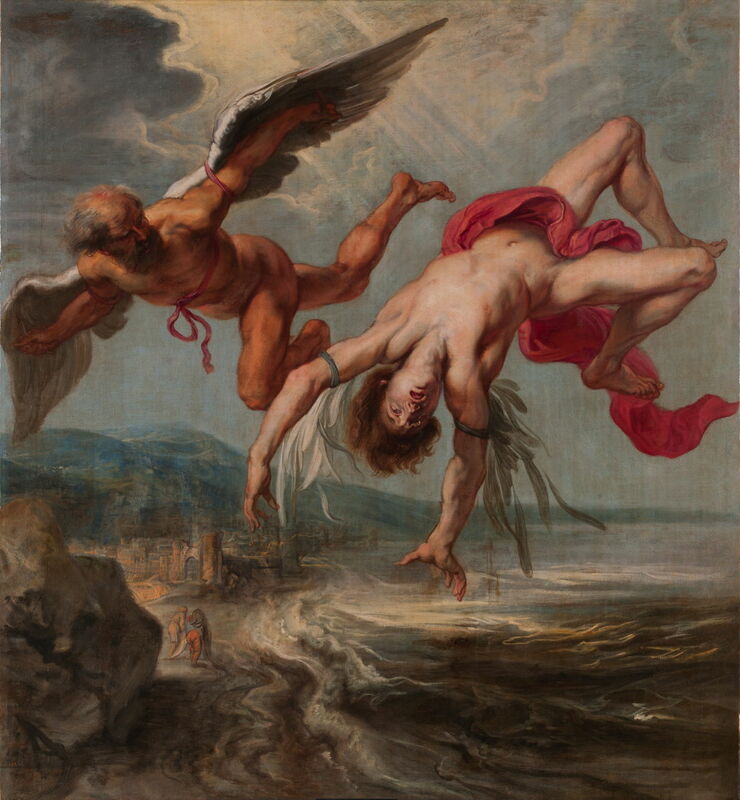 Gowy’s (c 1615-1661) The Fall of Icarus (1635-7) and Rubens’ (1577–1640) The Fall of Icarus (1636) are almost identical. Gowy was working at this time as an apprentice within Rubens’ workshop, and may therefore have made his finished painting from Rubens’ initial oil sketch, or both may have been painted by the same hand. They show Icarus, his wings in tatters, plunging down through the air past Daedalus. Icarus holds both his arms up as if still trying to fly despite the loss of his wings, his mouth and eyes are wide open in shock and fear, and his body appears to be tumbling as it falls. Daedalus is still flying, his wings intact and fully functional; he looks alarmed, towards the falling body of his son. They are both high above a bay containing people and a fortified town at the edge of the sea, now named Icaria. Merry-Joseph Blondel (1781-1853), The Sun or the Fall of Icarus (1819), mural, 271 x 210 cm, Denon, first floor, Rotonde d’Apollon, Musée du Louvre, Paris. By Jastrow (2008), via Wikimedia Commons. Blondel’s (1781-1853) spectacular painted ceiling showing The Sun or the Fall of Icarus (1819) combines a similar view of Daedalus flying on, and Icarus in free fall, with Apollo’s sun chariot being driven across the heavens. There is nothing to suggest that it is being driven by Phaethon, though, and the chariot appears to be making normal progress with its horses under control. 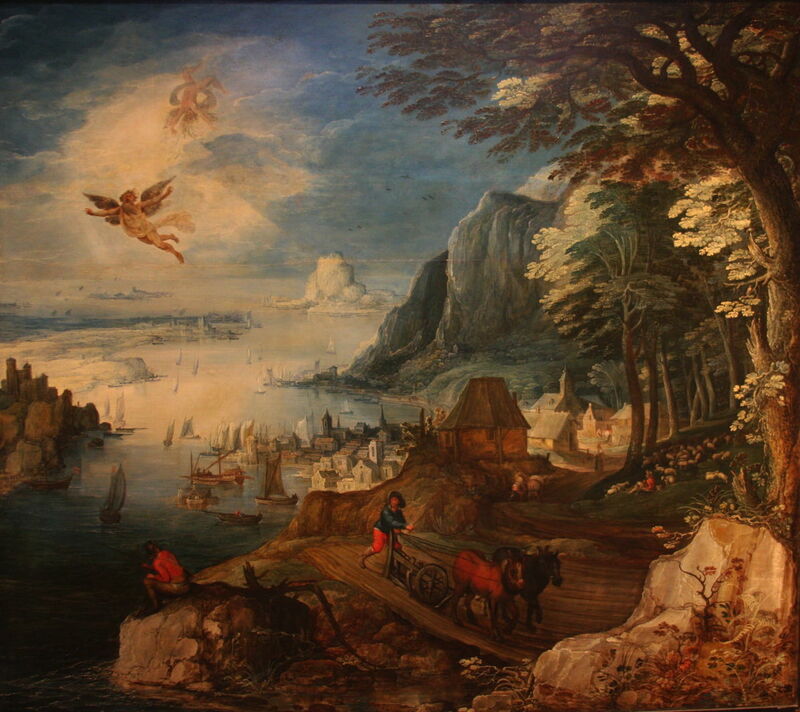 Joos de Momper (II) (1564–1635), Landscape with the Fall of Icarus (c 1565), oil on panel, 154 x 173 cm, Nationalmuseum, Stockholm, Sweden. Wikimedia Commons. a ploughman resting on the handles of his plough. This painting shows all three, which are easily spotted as de Momper has helpfully painted their clothing scarlet. Up at the top left, Daedalus is seen to be flying well, but Icarus is in an inverted position as he tumbles down. 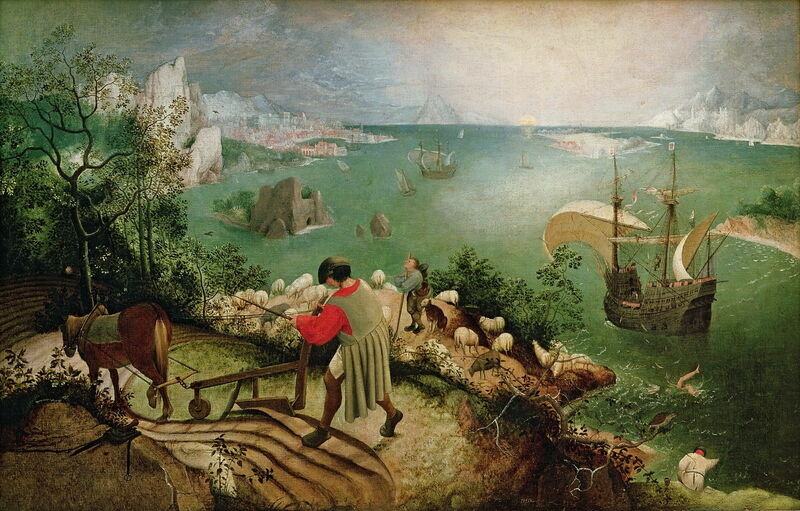 Long believed to be Pieter Brueghel the Elder’s (1526/1530–1569) original painting, his Landscape with the Fall of Icarus is now thought to be a very good copy of the original from about 1558, and possibly also painted by de Momper. It is similar in approach: the painting is a big landscape in which Ovid’s three other activities are shown, although here with less help from colour coding. However Icarus has already plunged into the sea, only his legs being visible above the surface, slightly closer to the viewer than the prominent ship at the right. From the direction of gaze of the shepherd, Daedalus has flown off to the upper left. Vlaho Bukovac (Biagio Faggioni) (1855–1922) The Fall of Icarus (panel of diptych) (1898), oil, dimensions not known, National Museum of Serbia, Beograd, Serbia. Wikimedia Commons. Vlaho Bukovac (Biagio Faggioni) (1855–1922) painted two different versions of Icarus reaching earth: in The Fall of Icarus (1898), one panel of a diptych about this story, he shows Icarus on the seabed, as he drowns, the remains of his wings still visible. Vlaho Bukovac (Biagio Faggioni) (1855–1922) Icarus on the Rocks (1897), oil on canvas, dimensions not known, Moderna Galerija, Zagreb, Croatia. Wikimedia Commons. 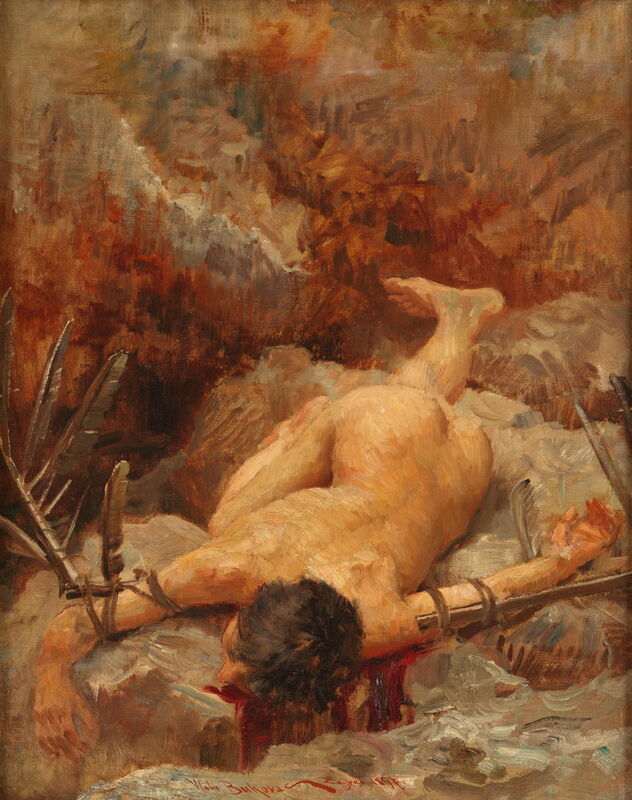 His earlier Icarus on the Rocks (1897) departs from Ovid’s account and has Icarus crash onto rocks; his posture is similar in the two paintings. Herbert James Draper (1863–1920), Lament for Icarus (1898), oil on canvas, 182.9 x 155.6 cm, The Tate Gallery, London. Wikimedia Commons. 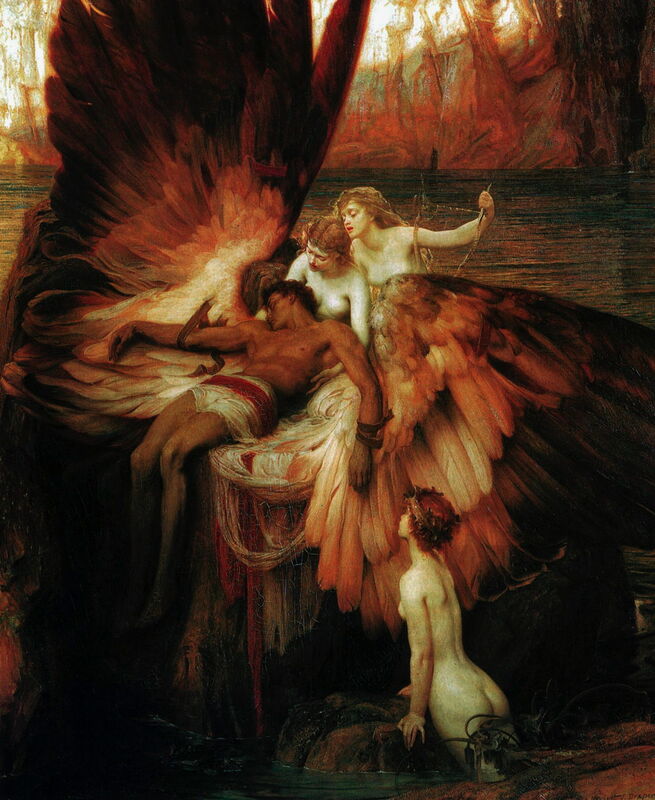 Finally, Herbert Draper’s (1863–1920) Lament for Icarus (1898) shows a more apocryphal and romantic view, in which three nymphs have recovered the (apparently dry) body of Icarus, and he is laid out on a rock, while they lament his fate, to the accompaniment of a lyre. Perhaps influenced by contemporary thought about human flight, Draper gives Icarus huge wings, and they are shown intact, rather than disintegrated from their exposure to the sun’s heat. In the 250 years over which painters have sought to depict this story, they have shown most of the events which make up its narrative. Although those showing preparations for flight have been effective depictions, they rely on the viewer’s knowledge of the outcome, and Icarus’ fate. None has been able to build in sufficient cues or clues to the climax. Paintings showing the climax, of Icarus plummeting through the air, have had sufficient cues and clues to the prior events for them to meet the requirements for peripeteia, thus to be powerful and emotive. However the unusual treatments of Pieter Brueghel the Elder, Joos de Momper, and followers, who showed small and distant images of Icarus overwhelmed by a greater landscape do not appear to be so effective, although they do allow incorporation of small details from Ovid’s account. 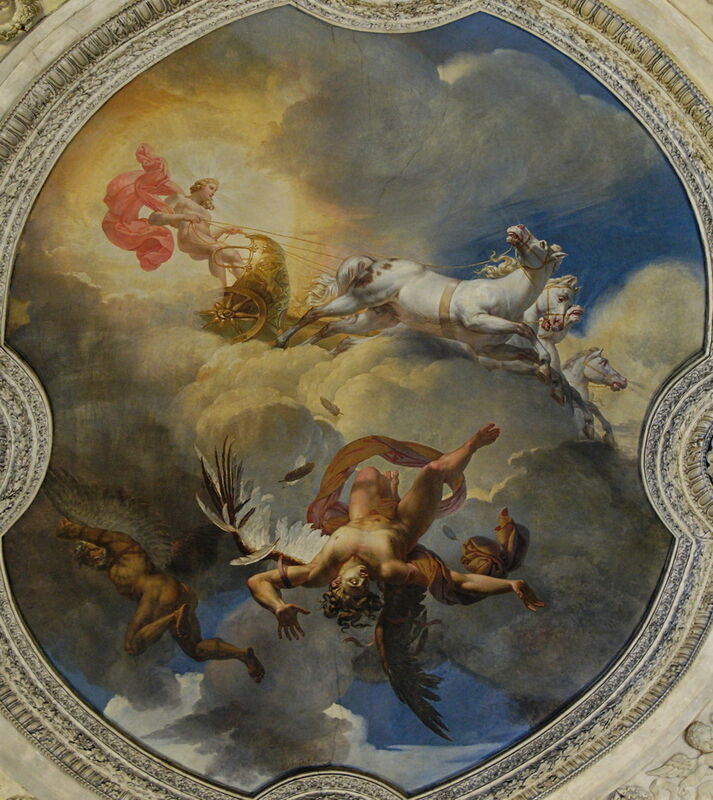 Blondel’s spectacular painted ceiling may tend to confuse the viewer with its references to the sun chariot, which might in turn seem to be a reference to Phaethon. Overall, I think that Rubens and Gowy provide the most vivid and gripping depiction of this story, in correctly identifying the best moment and ensuring that it is expressed clearly and without any grounds for confusion. A hypertext analysis based on this article is available here, including a complete downloadable copy. Posted in General, Painting and tagged Brueghel, Daedalus, Icarus, Leighton, narrative, Ovid, painting, Phaethon, Rubens, van Dyck. Bookmark the permalink.